This is the fourth in a series of articles covering “unpopular” larger companies. Benjamin Graham believed that such companies may present opportunities for enterprising investors. We discussed the Graham approach in more detail in a recent article. It is impossible to escape the daily barrage of terrible news from the Gulf of Mexico. BP is obviously the target of unceasing criticism, much of it well deserved, and the company’s share price has reflected a great deal of uncertainty regarding ultimate liability and the safety of the dividend. However, investors are also abandoning nearly any company involved in the oil sector regardless of exposure to the spill or to the drilling moratorium in the Gulf of Mexico. As we pointed out in previous articles on Noble Corporation and National Oilwell Varco, investor panic often creates interesting opportunities for long term investors. Ensco International plc is an offshore contract drilling company that provides services to oil majors and independent oil exploration firms. The company has historically focused on jackup rigs designed for relatively shallow water but has devoted the majority of capital expenditures in recent years to build up a fleet of semisubmersible rigs capable of deepwater operations. Ensco has a fleet of 45 mobile offshore drilling units comprised of four semisubmersibles, 40 jackups, and one barge rig. In addition, the company has one new semisubmersible unit ready for deployment in August and three semisubmersible units scheduled for delivery in 2011 and 2012. Ensco is geographically diversified with significant revenues originating from its Europe, Africa, and Asia Pacific reporting segments. 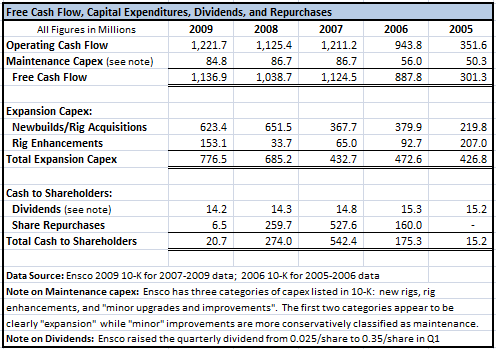 The chart below shows Ensco’s 2009 revenues broken down by business segment. Ensco segregates worldwide deepwater operations into a separate segment and has regional segments for shallow water operations using the company’s large jackup fleet. 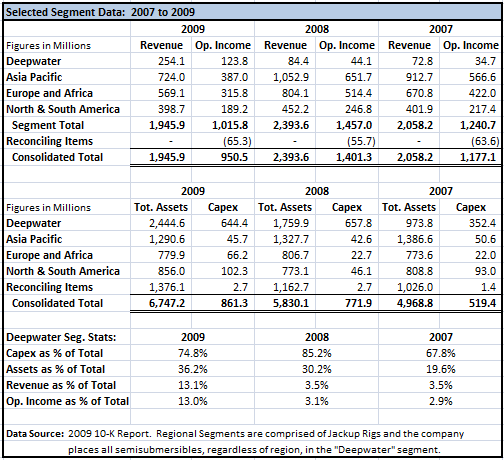 We can see that shallow water operations comprised 87 percent of revenues in 2009. Furthermore, shallow water activities outside the Americas accounted for 66 percent of revenues. Clearly Ensco is not principally a deepwater player in the Gulf of Mexico. The following exhibit shows some key data from the past five years. Note that the company does not employ much leverage and has enjoyed healthy margins over this timeframe due to the overall strength in oil prices which has led to healthy rig demand and high dayrates. However, the company’s return on equity has decreased somewhat due to significant cash balances earning low returns (cash balance was over $1.2 billion as of March 31, 2010). Additionally, high levels of capital expenditures on semisubmersible deepwater rigs over the past three years have only started to generate meaningful revenue recently as newbuild rigs enter service. High oil prices and healthy demand for the company’s services have resulted in Ensco resembling a cash generation machine in recent years. Much of the cash flow has been devoted to the company’s expansion program which has focused on building up the fleet of semisubmersible rigs capable of operations in very deep waters. In addition to investing in capex, Ensco has returned cash to shareholders in the form of dividends and share repurchases. The company recently increased the regular quarterly cash dividend to $0.35/share from $0.025/share. The exhibit below shows the cash generation capability of Ensco over the past five years along with the use of the cash. The company expenses regular maintenance on existing rigs. We have classified a portion of the capital expenditure program as “maintenance capex” to reflect minor upgrades of existing rigs that could arguably not increase rig capabilities. The vast majority of capex has been identified as rig enhancements or newbuild rigs. As noted previously, Ensco’s cash balance has increased dramatically and stands at over $1.2 billion as of March 31, 2010. Since the recently enhanced dividend will consume approximately $200 million per year, management seems to be aware of the negative aspect of continuing to pile up excess cash on the balance sheet. 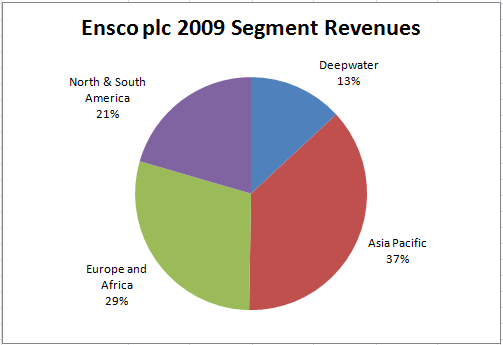 As the chart above demonstrates, Ensco is well diversified geographically and current revenues are dominated by shallow water operations outside North and South America. However, management is clearly committed to expanding deepwater operations significantly. The vast majority of capex over the past three years has been dedicated to the deepwater segment. The exhibit below shows selected segment data for the past three years. The importance of deepwater has increased even further in the first quarter of 2010. Deepwater operations accounted for 29 percent of revenue and 39.8 percent of operating income for the first quarter — a dramatic increase over full year 2009 statistics. In other words, the large level of capex allocated to the deepwater segment over the past three years is now starting to generate significant revenues and profitability as more semisubmersible units become productive. Ensco has ten rigs located in the Gulf of Mexico. Seven jackup rigs are operating in shallow water areas at dayrates ranging from approximately $50,000 to $100,000. 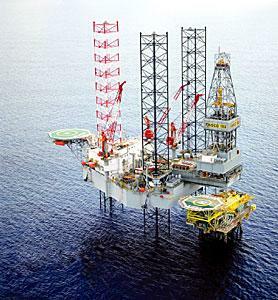 Two semisubmersible rigs are operating in deepwater areas at estimated dayrates of $295,000 and $365,000. One newbuild semisubmersible rig is contracted to begin operations in August at a dayrate of approximately $480,000. The exhibit below lists each of Ensco’s rigs located in the Gulf of Mexico based on the company’s May 14 rig status report. 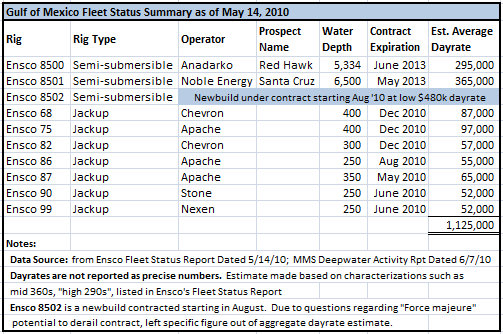 Ensco Investor Relations has indicated that the next fleet status report will be posted on June 15. The company did not respond to a request for an interim update prior to the June 15 report. Last week, we pointed out that there was much confusion regarding the Federal Government’s moratorium policy related to shallow water exploration. As of today, it is still not entirely clear whether the government intends to stand in the way of shallow water operations, although indications are that such exploration will probably continue to be permitted. Deepwater exploration is obviously another matter. President Obama continues to insist on the six month moratorium on deepwater exploration but the significant impact on the Gulf Coast economy has caused prominent politicians such as Louisiana Governor Bobby Jindal to argue for lifting the moratorium. Under a worst case scenario for deepwater, the “force majeure” clauses in Ensco’s contracts may be activated and the company may lose the anticipated revenues from Ensco 8500, 8501, and 8502. However, the company’s extensive global operations make it highly probable that these rigs will be redeployed elsewhere within a reasonable timeframe. In a recent conference call, Ensco Chairman and CEO Dan Rabun stated that the Ensco 8500 series is “perfect for Brazil, Gulf of Mexico, and West Africa and Asia”. Furthermore, since most contracts call for Ensco’s customers to pay “mobilization” costs for rigs, it is possible that the rigs could be redeployed elsewhere without Ensco paying for substantial transportation costs. How Good is Tangible Book? Earlier, we stated that one must examine what is in tangible book value before an investor gets too excited about a company that is trading at or below tangible book. The quality of assets is obviously critical if tangible book is to be considered a margin of safety for the investor. The critical component of Ensco’s tangible book value is the property and equipment account which is stated at $4.5 billion as of March 31, 2010. Since a great majority of the company’s tangible book value resides in illiquid offshore drilling rigs, can we feel somewhat confident that the assets are worth what they are stated on the balance sheet? While it is very difficult to make a definitive assessment, three recent asset sales provide a clue that management is conservative regarding the valuation of rigs. The company sold Ensco 57 on April 23. Ensco 57 sold for $47 million while the rig had a net book value of $30 million. On March 19, the company announced the sale of Ensco 50 and Ensco 51. These rigs were sold for $95 million and had a net book value of $63 million. The cumulative gain on sale for the three rigs came to approximately $49 million. While the sale of three older jackup rigs may not be reflective of overall valuation of the fleet, a positive surprise upon the disposition of assets is a good sign that management might be conservative. Ensco plc is a well diversified, high quality company that appears to have been unfairly punished in recent weeks based on “guilt by association”. When a high profile incident has a major impact on an industry, market participants often sell any company in the industry first and ask questions later. With a market capitalization only slightly above tangible book value, diversified international operations, and what appears to be manageable exposure to the deepwater Gulf of Mexico, investors should have some downside protection. The company is not without risk, but the relevant risk is related to the potential for depressed energy prices that reduce demand for the company’s rigs rather than any specific regulatory action related to the Gulf of Mexico. In the event of a “double dip” recession that reduces worldwide demand for oil, Ensco’s profitability and cash flow would decline along with every other contract drilling company. However, the long run demand for fossil fuels in the developing world makes the case for a long run decline in oil prices highly doubtful. Alternative energy sources are decades away from threatening to seriously displace oil and gas as fuels. In contrast to Noble Corporation which we profiled last week, Ensco has not suffered the same magnitude of decline since late April and the company is more expensive in terms of cash flow or earnings multiples. The likely reason is that Noble is much more exposed to the Gulf of Mexico deepwater than Ensco, although even Noble is well diversified from a geographical standpoint. In the event of a favorable outcome for deepwater regulation in the Gulf of Mexico, Noble is likely to have a more rapid recovery. If the deepwater moratorium continues for a longer period or becomes permanent, Ensco may be the better choice. Both companies seem to offer a favorable risk/reward profile at current quotations. Disclosure: No Position in Ensco plc but considering long position. Long Noble Corporation.